Sam was born and raised in Northern Virginia. He graduated from W.T. Woodson High School and attended Rutgers University for his undergraduate studies, where he met his wife, Tricia. 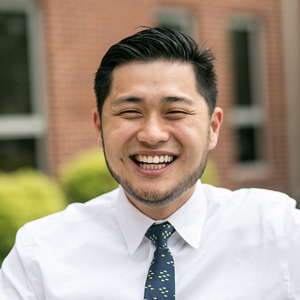 After finishing up his undergraduate studies, he served with a missionary in China for seven months before attending Regent College in Vancouver, BC, where he spent three years pursuing his Masters of Divinity degree. He is passionate (to a fault) about DC sports teams, food, and most of all he is passionate about Student Ministry. Student Ministry has been a passion that God has placed in his heart since college and it hasn’t stopped growing, especially as he continues to learn about God’s heart for the youth.